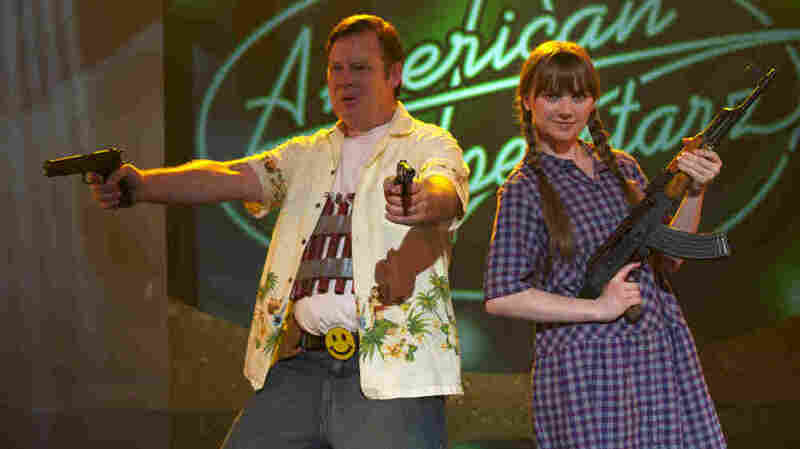 Movie Review - 'God Bless America' In a black comedy taking aim at American popular culture, a middle-aged man with terminal cancer (Joel Murray) decides to kill lowlifes — including texting moviegoers and reality TV stars. Critic Ella Taylor says God Bless America is a one-trick pony, but delivers venomous cultural criticism. Note: Contains profanity and violent imagery that some may find disturbing. Ever thought about murdering popular culture and its hangers-on? If your current homicidal fantasies include whacking the gelled hipster who loudly water-coolers yesterday's idiot reality show for anyone who will listen — and many who'd rather not — you may find yourself rooting for Frank, the unlikely dragonslayer of Bobcat Goldthwait's bracing new black comedy God Bless America. Pudgy, timid and awkward, Frank — played by Joel Murray, brother of Bill, and man are those Murray boys good at sullen deadpan — is the kind of put-upon cootie-carrier you may remember shunning in high school. Now he's middle-aged, and far from having blossomed into his adult self, he finds himself divorced from a wife whose indulgent parenting has turned their daughter into a bratty hysteric, and fired from a drearily generic office job for "harassing" (sending flowers to) a colleague with Judas tendencies. To make matters worse, a callously indifferent doctor informs Frank that he has terminal cancer. No wonder he keeps stuffing a revolver in his mouth. What Frank has going for him, though, is a gift for venomous cultural criticism he shares with his creator. If you've seen any of Goldthwait's previous work — the cult hit Sleeping Dogs Lie and the under-appreciated World's Greatest Dad — you'll know that this maverick cross between Bill Maher, Louis C.K. and Jimmy Kimmel has a way of putting his finger on the zeitgeist and pressing hard to make us squirm. Slumped on his lonely couch, remote in hand, Frank seethes quietly at the steep descent of American popular culture into a cesspool of ill-mannered shows that degrade and trivialize their participants. Help is at hand, though, and ready to turn his self-loathing outward toward another target: "the people who deserve to die." Like Frank, Goldthwait despises not just the reductive stupidity of the lesser echelon of reality television, but its escalating cruelty and incivility. Defending God Bless America at a Los Angeles preview from "the middle-aged women who hated it" at test screenings around the country, he summed it up as "a very violent film about kindness." That it is. Roxy, being a teenager, wants to blow away the world, no questions asked. But there's an underlying sweetness and ethical urgency to Goldthwait's work, no matter how hairy the action gets. Frank is on a moral mission; like every knight he has a code of honor, and he draws distinctions. He won't sleep with Roxy no matter how much she bats her eyelids, and having gunned down a row of cellphone abusers, he thanks the others for not ruining his viewing experience. Not that Goldthwait is willing to let anyone, least of all his audience, off the hook. God Bless America ends with a couple of tale-twisting bullet orgies designed to take your preconceptions, as well as your nerve-endings, by surprise. Frank may be a crusader for civility, but Goldthwait won't let us forget that his cleansing operation is a logical extension of precisely the brutality he seeks to avenge. Decide for yourself whether that's a victory for decency, or a cry of despair.